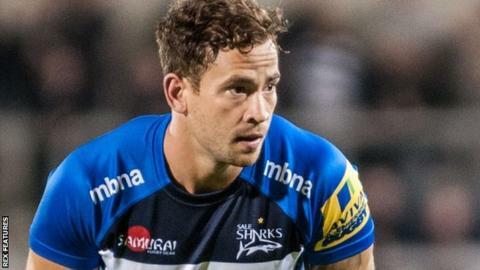 Sale Sharks fly-half Danny Cipriani has stated he will decide his future at the club in the coming weeks. Cipriani signed a two-year deal last year but is understood to have a break clause this season. The ex-Wasps and Melbourne Rebels number 10 is a target for Top 14 side Toulon as well as Premiership clubs. "The decision on my future is something I'm going to have to make within the next week or so," he told BBC Radio Manchester's Rugby Union Extra. "I've not kept Dimes [director of rugby Steve Diamond] in the lurch with anything, we have a very good relationship. "We talk very openly about a lot of things, so it's not like he doesn't know what the decisions or options are for me. "It's no discredit to Sale or credit to anyone else - it's something that I'm going to have to really think about, whether that be my family or things to do with my mum, or whatever it might be, there is a lot that comes into it." Cipriani was not included in new England head coach Eddie Jones' first squad selection for the upcoming Six Nations. He has revealed he is in regular contact with the Australian but was disappointed to not get more game time under Stuart Lancaster. "I'm going to sit here and say 'I didn't feel like I got a fair crack of the whip', but he chose what he felt was best," Cipriani added. "I can't complain or moan about that. He gave me 20 minutes in France away, I got voted man-of-the-match and that was all I could do really. "That was the only chance I really got and he still didn't decide to include me and I fully understood that because he people in squad that were there at the beginning of his reign and he built camaraderie, trust, respect or whatever it may be."